One of the markers of a youthful, healthy face is plump, round cheeks. But with age, you may have noticed that your cheeks have become flatter and saggier, and your face appears more angular or hollow than it used to. If this bothers you or makes you self-conscious, Charles S. Lee, MD, and the team at Enhance® Medical Center can help. What Happens to the Cheeks with Age? The aging process affects the appearance of the cheek area in several ways. First, the body’s production of collagen and elastin slows down. Without enough of these proteins, the skin starts to sag, crease and wrinkle. The cheek skin can appear to sag off of the cheekbones and droop toward the jawline. Next, the fat that gives the cheeks their shape and plumpness atrophies and sags. This causes the cheeks to “deflate” or flatten over time, losing their youthful roundness. Finally, the cheekbones themselves can shrink and recede. One of the most common ways to treat hollow cheeks is to inject them with soft tissue fillers like Juvederm or Restylane. A Juvederm filler called Voluma is specifically designed to add volume to the cheek area. 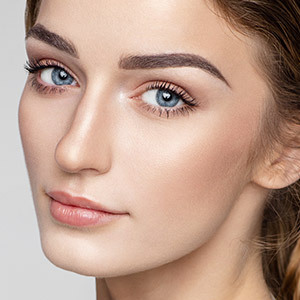 When administered by a qualified injector, dermal fillers can help restore a very natural plumpness to the cheeks, giving the face a more youthful appearance. Filler treatment can be completed in a short amount of time and the results appear within a few days. Depending on the product, the effects of filler treatment can last anywhere from a few months up to a year or more. Voluma has been shown to last for two years. Regular treatment is needed to maintain the effects long term. Cheek implants can also be used to improve the projection of the cheekbones and add volume to flat or recessed cheeks. These biocompatible implants come in a variety of shapes and sizes and can be inserted during a simple surgical procedure. Finally, if you are bothered by several age-related changes in your mid- or lower face, you might opt to have facelift. The “gold standard” of facial rejuvenation can help improve the appearance of sagging cheeks, deep creases or folds around the nose and mouth, a slackened jawline and loss of definition in the lower face. To discuss your surgical and non-surgical treatment options with Dr. Lee and our team, please schedule an appointment by calling (310) 271-5954 or sending us an email.